As we all know, the issue of female choreographers is one which has been haunting the dance industry for many years: while a lot can be said and done about it, not much has been said and even less has been done over the years. Again, as we all know, the root of the problem is that we're working in an industry which is predominantly female yet the opportunities, recognition, commissions and awards typically go to the disproportionately small male minority. (Someone recently pointed out that New Adventures's original publicity for the next round of their Choreographer Award somehow omitted their two female winners from their mention of past winners; this has since been amended). The topic of female choreographers is a proverbial iceberg in its own right, encompassing so many issues and areas, which is one of the reasons why it's been so hard to tackle this problem properly: because nobody understands it fully, and unless you understand what the problem is, it's hard to address it successfully. We've had short-term projects such as The Table, led by Charlotte Vincent for older female choreographers, which ran from spring 2012 until late 2013, aiming to "generate a new community for creative women" through dialogue and exchange, and the Female Choreographers' Collective, run by Holly Noble and Jane Coulston, founded in 2012, which sought to promote and support female choreographers within the UK, but which has been on intermittent hiatus since 2013 due to personal reasons. But despite the efforts of both projects, and the extensive research of the latter, the industry hasn't changed: we still work in an industry where the majority of participants are female, where the majority of GFA recipients (as individuals, not companies) are female, and yet this isn't reflected in the selected few who are having an impact on our industry. Enter The BENCH, the new initiative by Tamsin Fitzgerald of 2Faced Dance to address at least some of these issues and promote equality within the contemporary dance industry. The BENCH is a three-year project running from 2015 to 2018 which offers training, mentoring, opportunities to learn from leading experts, create new work and be commissioned, and which aims to provide a voice for women working in the arts. Eighteen female choreographers - Fellows - will be selected over the three-year period and will be offered a series of masterclasses, intensive training sessions, ongoing mentoring and opportunities to connect with venues, programmers and commissioners; they will also be assisted in developing skills and confidence to compete equally for high-profile commissions. One Fellow per year will also have a further opportunity to have her work commissioned and performed by a national dance company. On Tuesday 17 May 2016, a conference will be held in partnership with IDFB to present the findings of the programme so far, covering topics such as where the sector needs to change; additionally, a manifesto will be launched which, it is hoped, venues and promoters will sign up to and take forward, signing up to equality in the arts. The first Fellow commission will also be announced during the conference. The mentors who will be working with The BENCH Fellows are Sharon Watson (Phoenix Dance Company), Charlotte Vincent (Vincent Dance Theatre), Rosie Kay (Rosie Kay Dance Company), Liv Lorent (balletLORENT), Kate Flatt (Kate Flatt Projects) and Tamsin Fitzgerald (2Faced Dance Company). The BENCH aims to develop the next generation of female choreographers and promote the work that they do, and it is hoped that the eighteen alumni over three years will have a significant impact on how female choreography is perceived and received in this country. The BENCH also wants to challenge the attitudes of producers, promoters, venues and programmers to ensure that women are considered seriously for projects and programming, allowing women's voices to be heard on the stage on a more regular basis; The BENCH is seeking to build a network of venues and producers both in the UK and abroad who will promote the work of female choreographers. And that will be The BENCH's greatest hurdle: challenging existing attitudes, and trying to change how things are done. But considering the people involved with The BENCH - Tamsin and the panel of mentors - if anyone can achieve this, it's them. The BENCH is seeking applications for its first year, for which it will be selecting five Fellows; the application form and application criteria can be found on www.the-bench.org, and the application deadline is 5pm on Friday 7 August. So get applying, quickly. 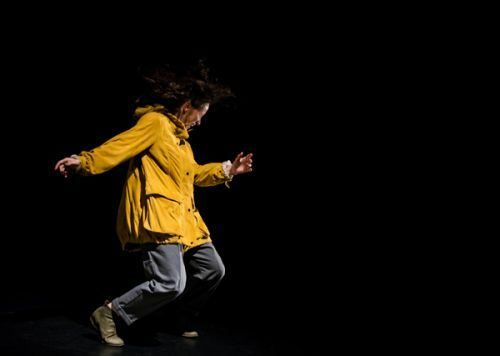 Photo of Kate Jackson performing in an excerpt of Red Road Dance Theatre's 'The Sense of an Ending' at the Robin Howard Theatre, London, choreographed by Nadia Iftkhar and photographed by Chantal Guevara.